My latest character, Lucy Kendall, is my darkest creation yet. Fundamentally, she's very different from me, and yet the traits that make her most human and relatable, are very much my own. I'll get this out of the way right now: Lucy is a killer, although she doesn't quite accept it yet. Her prey are the dirt of society–pedophiles. She tracks and eradicates them with very little guilt. When I decided to create Lucy Kendall, I knew I was taking a risk and the only way it would pay off is if people would like her despite her choices. That meant making her relatable, and that meant digging deep. Obviously, I'm not a killer. But her very black and white attitude about child molesters comes directly from me. I don't believe in recidivism or second chances. But that's the easiest comparison, the one that drove the story without any extra thinking. The tough one was her fear of death. It's a bit of irony, this serial killer (don't call her that, however!) being so terrified of death that she wakes up at night in cold sweats. This is a fear I've harbored for years, one that is so hard to describe I'm still not sure I've done it justice with Lucy. But it drives much of my interests, and I knew that to make Lucy relatable, I had to put this key part of myself into her. You see, my fear of death also drives my fascination with it, which in turn makes me a mystery and thriller writer who Googles things like ketamine and the dark web. Without it, I would be an entirely different person, and I'm not sure Lucy would exist. Think about all the characters you've loved, even if you hated them. Whatever part that resonated with you is something you saw in either yourself or someone in your own life. That's why GONE GIRL is such a monster hit despite both characters being at least semi-unlikable. They're imperfect and annoying and miserable and manic, and every one of us has experienced those same feelings in a relationship. Of course, Gillian Flynn is a superb writer and storyteller, but I believe her ability to dig deep and think on an emotional level–to think about how she would feel, react, etc.–made her characters compelling. Whether we're talking about a thriller or a romantic suspense novel, it all boils down to characters. I believe that to create characters readers will never forget, we have to get past all the surface junk. Stop spending so much time on how they look and smell, and start talking about how they feel, think, and what drives the choices they make. 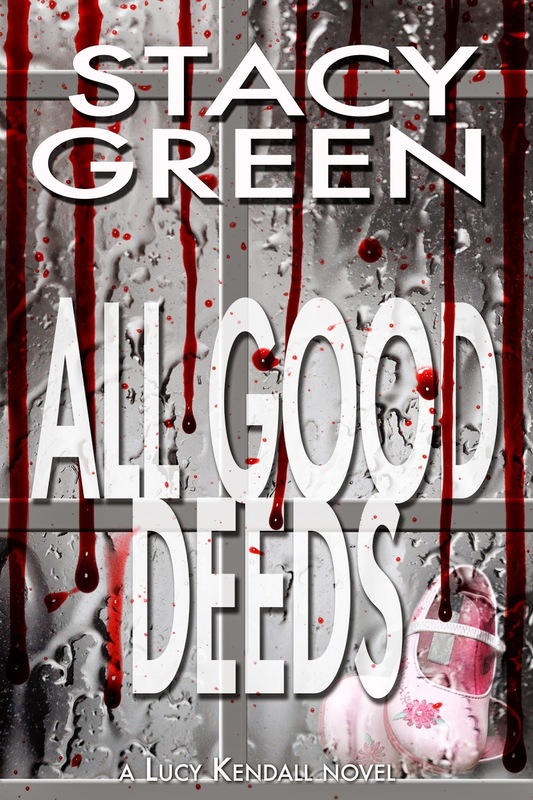 Writing ALL GOOD DEEDS was cathartic for me. It was the first time I actively let go of my worries about rules and what readers might think and let my own heart drive the story. It was exhausting, but it was also exhilerating, and I'm very proud of the book and character I've created. I hope you end up rooting for her as hard as I do. Who are your favorite characters? What is it that draws you to them? I carefully poured the contents of the vial into the glass and then put the empty container in a Ziploc bag and into my purse. My pulse beat at my temples, and the sweater felt hot. Or maybe that was just the adrenaline. I took a moment to collect my spinning thoughts. Steve sat two tables to the right of the restroom, against the wall. He’d been sitting hunched over his beer just like he does every other night. Almost recoiled, as if he were ready to run from a beating. Probably a habit picked up in prison. Now was the time for the inevitable doubts. What if I miss my mark? What if the reaction starts before I’m out of here? What if I get caught this time? I simply couldn’t allow them to creep in. Too many children hurt, too many kids lost, my own sister, gone. Because of men like Steve. I left the stall, took a deep breath, and sauntered out of the restroom. My gait was again tipsy, head down far enough not to make eye contact while still allowing me to see the room. Experience was the only thing that kept me from stopping in my tracks. Getting bumped into wouldn’t be good for my health. Damnit. He always finished his beers, and he’d just ordered another. Why had he left? I couldn’t stand there looking confused. A cough, a slight stumble to the left, and I quickly hurried to the bathroom. The place remained blessedly empty. I slowly poured the glass’s contents down the toilet, making sure the liquid only trickled and left no splash on the seat. Just in case, I wiped it off with a cleansing wipe. I ran the martini glass under the hot water and then stuck it back into the plastic zipper bag in my purse. So much for wrapping up this case tonight. The crowd seemed to have doubled in the last few minutes. Steve’s table was already taken. I chalked up my bitter defeat and headed for the door. The waitress would probably remember me after tonight, which meant I needed a new approach to Steve. He grinned, his smile listing somewhere between charming and arrogant. He stood to his full height–at least six feet, with broad shoulders and lean muscles beneath his long-sleeved shirt. Certainly easy on the eyes, and apparently not willing to take no for an answer. I was in no mood for a hookup, but my skin warmed with egocentric pride. It felt good to be noticed. I moved toward the crowd, but he was faster, closing the small distance between us. Standing less than an inch away from him, I smelled the pleasant scent of his cologne and caught a glimpse of bright blue eyes. ON SALE NOW! Click here to buy your copy! This sounds very intriguing .. are all your books written in first person? Thanks so much! No, All Good Deeds is the first one I have done in first person. I hope you enjoy Tin God!